Wi-Fi is wonderful…. when it works! Between the abstruse limited connectivity errors and random Wi-Fi disconnects, sometimes it can feel like Wi-Fi really isn’t that great. I can’t tell you how many times I’ve had to reset my home Wi-Fi router. It can be pretty unnerving. Wireless signals are emanating from your wireless router in all directions. The signal is omnidirectional. You can imagine your wireless signal as the surface of a disco ball with your router living in the center of that glittering ball of fun. But this analogy isn’t perfect because in the real world wireless signals are a bit amorphous. In fact, the energy field resembles ripples and waves and isn’t really spherical. Artist and blogger, Nickolay Lamm, worked with M. Browning Vogel, former NASA employee and astrobiologist, to illustrate what Wi-Fi would like like if we could see it. It’s actually quite beautiful. What you’ll notice is that the signal patterns aren’t really round. Since most people need coverage on a single floor (rather than vertically across floors), wireless router vendors tuned the signals to propagate closer to a horizontal orientation. The signal is also projected downward kind of like the light glowing from a street lamp. When you keep these things in mind, it makes the optimum placement of your wireless router obvious. The best place to setup your wireless router is right smack dab in the center of your house. Depending on your budget, it might make sense to move the internet source (Coax for cable internet or telephone wiring for DSL) moved as close to the center of your home as possible. If you need to hire an electrician go for it. You’ll get a more reliable wireless signal and everyone in the house will benefit. The default coverage area is about 150 feet (92 meters) indoors but that’s assuming the 2.4GHz space. When you get into the 5GHz frequency band (For example, 802.11ac) you’ll get less range; sometimes it can get sliced by a third. Ouch. Another thing to keep in mind is that the router should live in an elevated space. For example placing the router on a bookshelf on the second floor is better than placing it on the floor downstairs. Furthermore, the antenna’s should be sticking straight up because this gives you the widest lateral coverage. If your router doesn’t have an antenna, don’t worry about it because it’s probably using beamforming to automatically discover connected clients and adjust the signal power. Beamforming is a super cool technology that shapes the wireless signal and shoots it as a focused beam directly at each wireless device. Some swanky NETGEAR routers are known to use a variant of this technology called Beamforming+. Wanna guess where wireless signals work best? Wireless signals work best outdoors where there are little obstructions to attenuate the signal. But, since you probably don’t live outside, we’ll need to think about how to improve our indoor environments. The next best thing to placing your router outdoors is to suspend it in midair right in the center of your home. Computer geeks are still working on this whole levitation thing so this is still in the realm of science fiction for now. So that leaves us with boring desks and mundane walls. It actually turns out the that the most practical place to set your wireless router is on a desk or on the ceiling. A standard 3.5 inch brick wall or 2-inch solid wood door can chop your signal output by a whopping 50%. The key is to keep the router out in the open. Drag that thing from under your bed or take it out of the closet; it’s time for your Wi-Fi router to stop being shy. Wood paneling, furniture, clear glass and drywall have the lowest obstacle severity. Masonry is slightly more problematic. Mirrors, metals and water (like that giant aquarium in your living room) are the worst. Keep your router away from these places. You also want to make sure your wireless channel isn’t too close to the other channels near you. 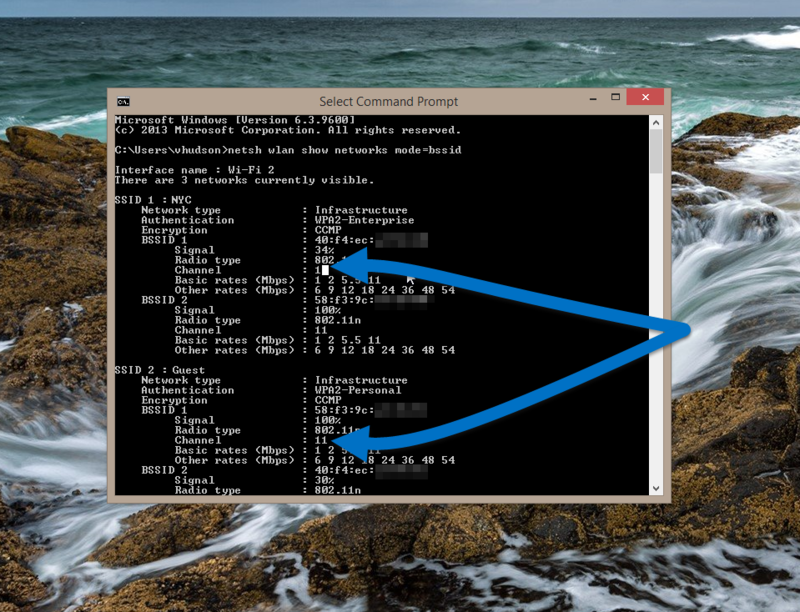 In Windows 8.1 there’s a quick (but little known) way to check your wireless channel from the command prompt. The BSSID is the basic service set identifier which is just a flamboyant term for the name of each access point. By the way, the network name is the SSID which can have multiple BSSID’s because you can have multiple access points inside a single network. I hope that didn’t sound crazy. Anyway, you want to pay attention to the channel numbers displayed for each BSSID. You’re looking for a hole, an opening, where you can wedge yourself in with at least 5 channels of separation from your neighbors. For example, you can see the wireless network named NYC is using channel 1; thus, my network should use channel 6 or 11. It’ll be optimized here. Once you know the channel, it’s just a matter of logging into your home router and making the change. The usually means typing http://192.168.1.1 in the address bar. It could also be http://192.168.0.1 or http://10.0.0.1 depending on your router so go dig in the manual if you’re not sure. Once you get into the admin panel you should see a section under your wireless settings that lets you change your channel. Set that, click Apply or Save and you’re good to go! Keep the router away from double pane windows and brick work. If you stick to my rules, I promise that you’ll have a substantively faster more reliable Wi-Fi experience.